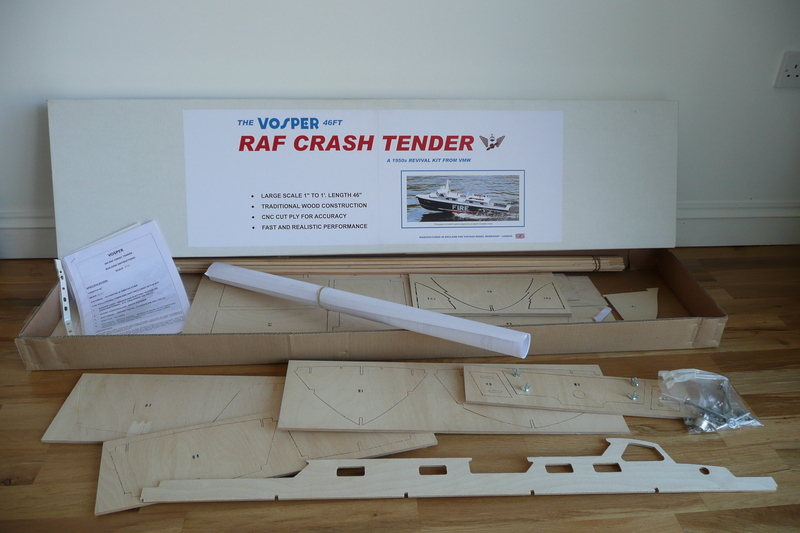 In 2003 after many modellers had expressed an interest in this popular design, the Vosper RAF Crash Tender or 46′ Firefloat Mk. 2 to give it its correct description was re-introduced as an improved all wood kit for the vintage enthusiast. 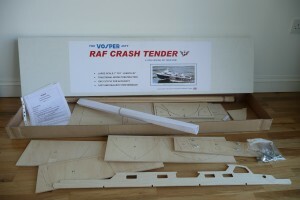 From Vintage Model Works comes the new 46″ largesize kit of this popular and exciting RAF craft. 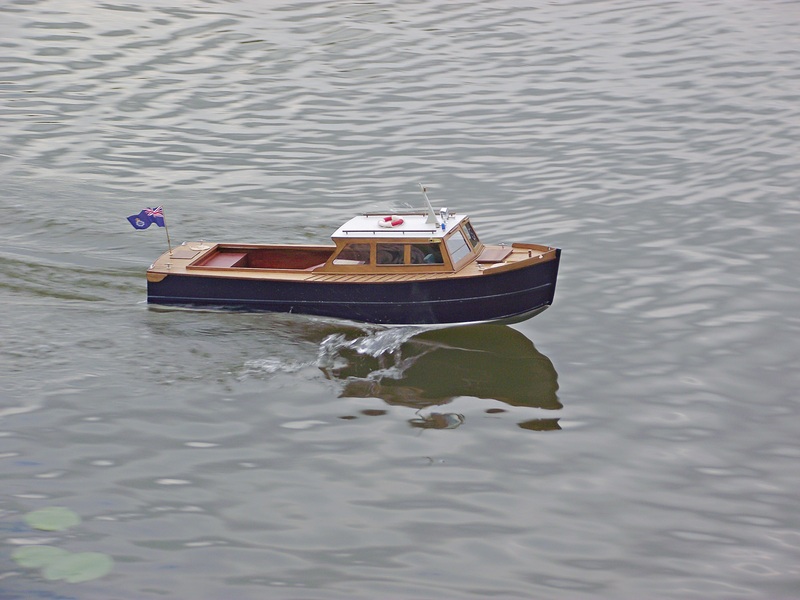 It may well bring nostalgic memories to senior modellers and it will appeal to anyone who enjoys building with traditional materials. 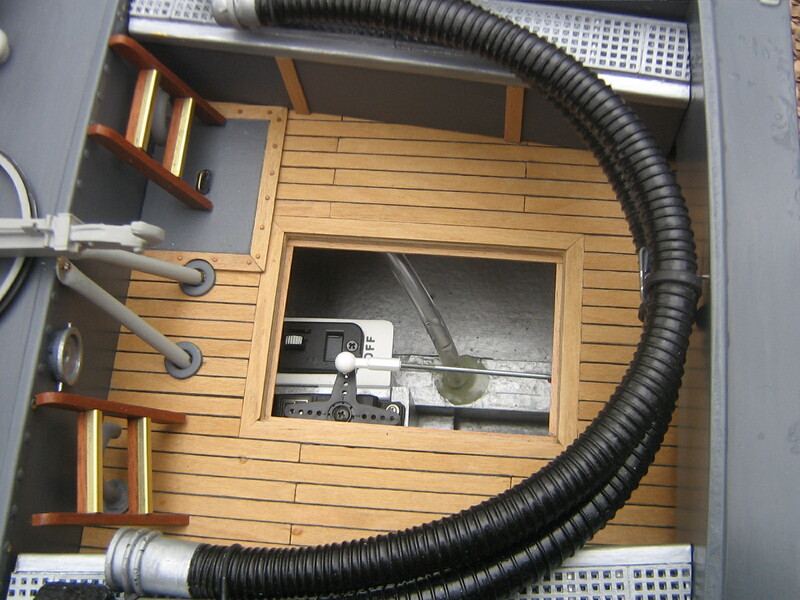 The wooden contents of this 1/12th scale kit are CNC cut from good-quality plywood which ensures accurate slots and more precise fitting of bulkheads and superstructure. Stripwood is obechi. 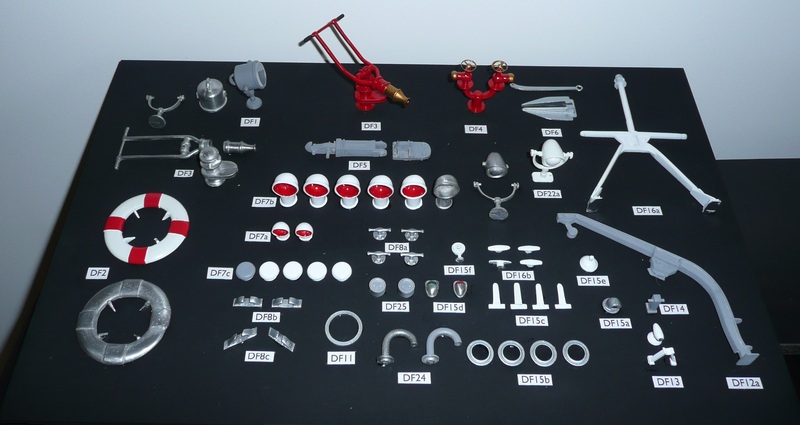 The deck fittings are traditionally cast in white metal. A full sheet of the correctly sized and design transfers is included which adds to the final finish of the model. Finally, the windows are laser-cut in perspex with matching frames for added realism. Some of the contents of the Kit Box which weighs in at approximately 8kgs. 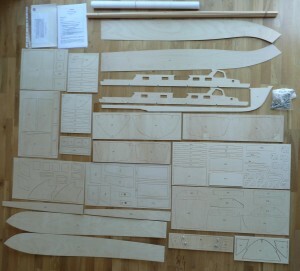 The contents of the kit showing pre-cut wood parts. All sheeting is also pre-cut. Plywood is used throughout except stringers which are obechi strip. 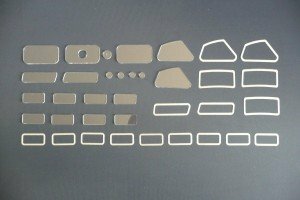 Accurate CNC computer cutting ensures good fits of components. 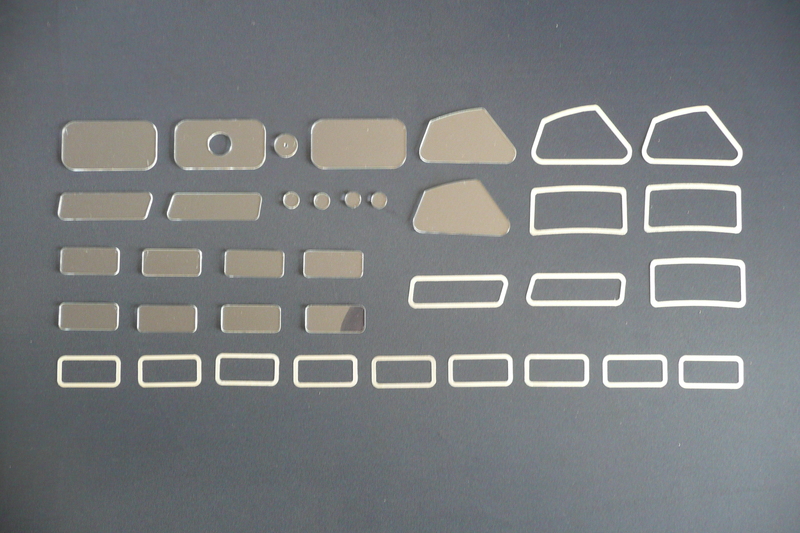 Parts are stamped for quick identification. All deck fittings are cast on white metal and are easily cleaned with a Dremel tool, files, wet & dry paper or sponge sanding pads. 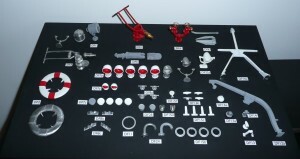 The final finish is applied with car acrylic paints, the total number of individual fittings is 56, as below. 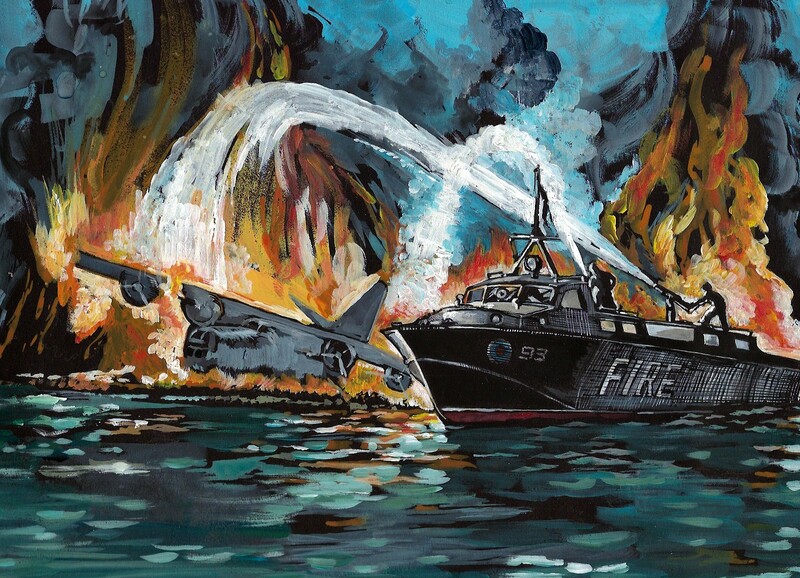 Water slide transfers as the original Vosper design are included in the kit. 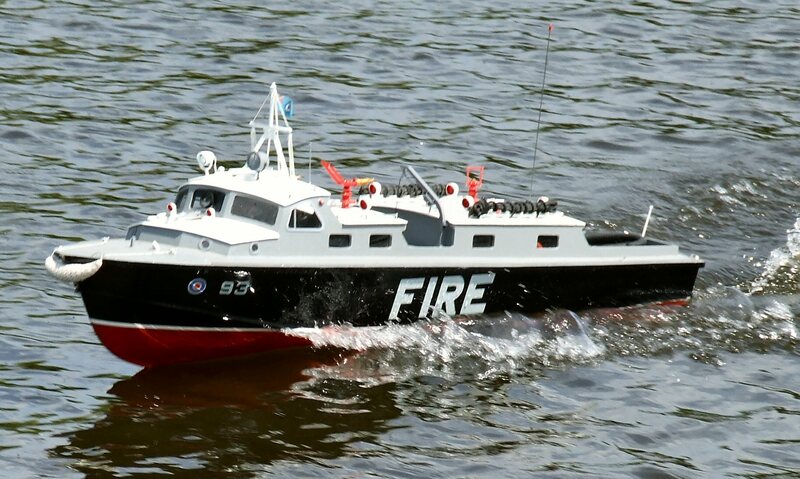 A set of clear plastic push-fit windows and frames have been produced for the VMW 46″ Crash Tender kit. A total of 16 window frames and 20 windows and port-holes are included in the kit. 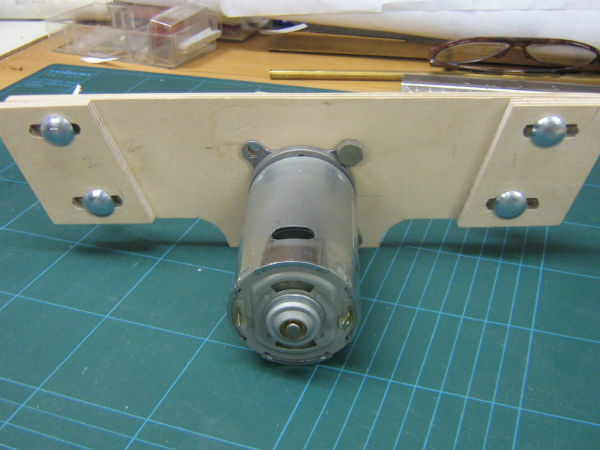 For modellers wishing to renovate old Aerokits models these may be modified for use. Frames should be painted in silver or aluminium colour for realism. The hard chine construction method is straghtforward. 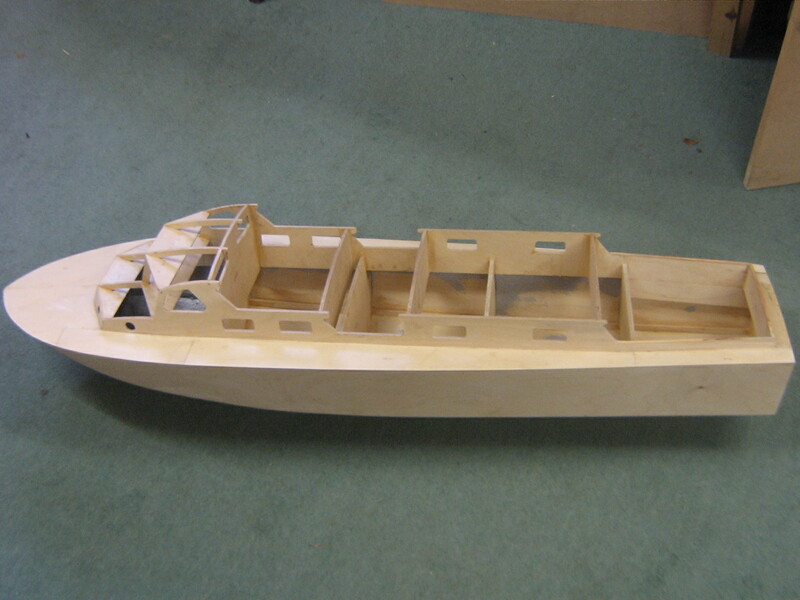 Bulkheads are 6mm ply with skins of 1.5mm forming a strong hull. In action in Bushy Park, S.W. London. Having built the RAF Crash Tender and fitted it with a powerful electric brushless motor you will be able to experience a life-like representation of the full-size boat. 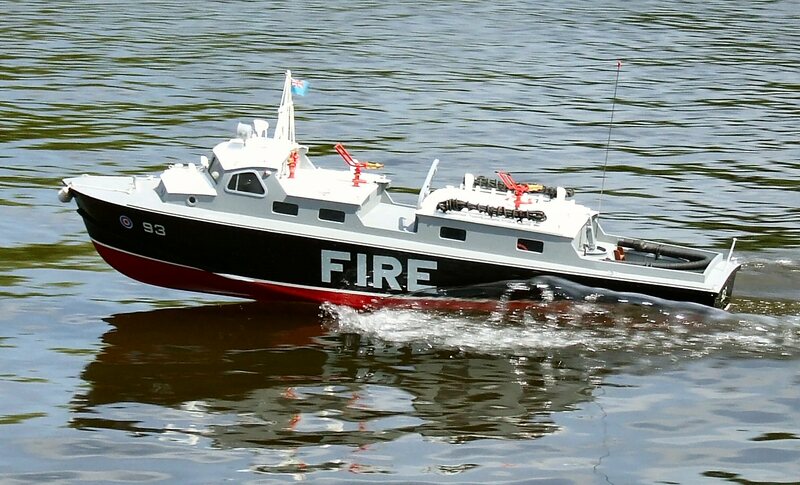 With the right combination of motor, speed controller, batteries and prop, the large Crash Tender will perform at speed for about 30 minutes. 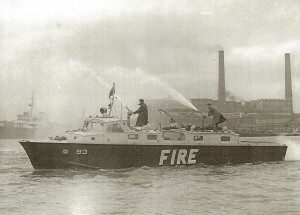 The full-size craft performing at speed in 1953. 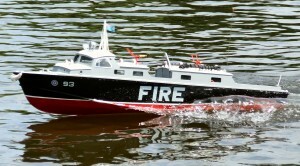 The similar pose of the model is evident. 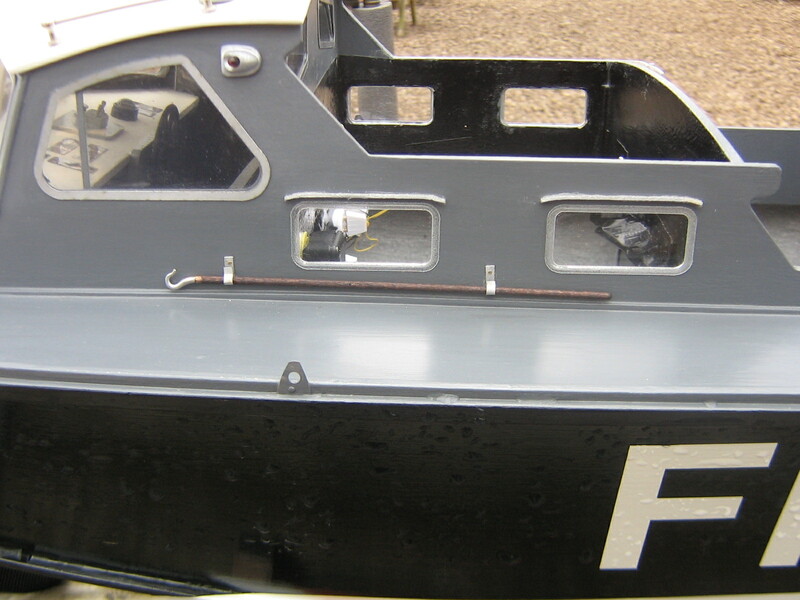 The lines of the Vosper design are good from all angles. 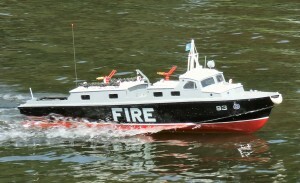 The model on the stand showing further detail. 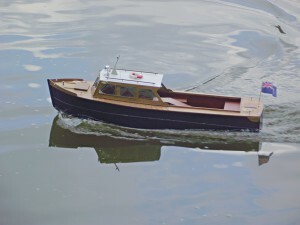 This model is a single shaft version but can be adapted for twin screw and rudder. 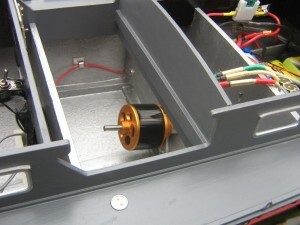 The Graupner 900 motor bolted to the supplied adjustable motor mount. 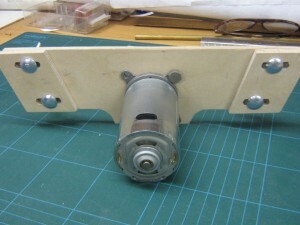 This enables easier alignment of the motor to the propshaft. The Scorpion brushless motor installed in a model built from the kit. More powerful and smaller than the Graupner 900. 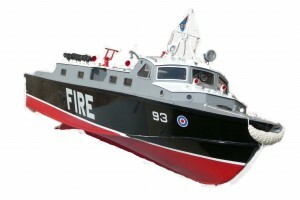 Extra realistic detail is applied to a kit model which enhances the appearance. This example is by a member of the Phoenix Model Boat Club in Surrey. 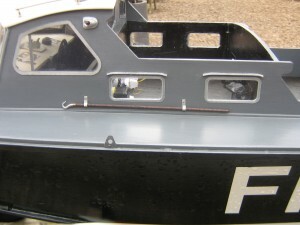 Another view showing additional detailing of cockpit with access to radio control equipment through small hatch. The whole of the floor can also be removed for access. 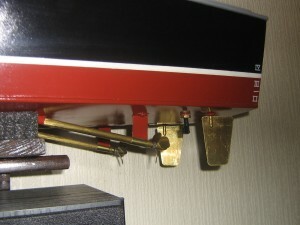 Detail of twin motor installation in one of the kit models constructed by a modeller in the Welwyn Club. 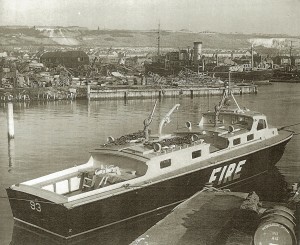 The introduction of the full-size Crash Tender in 1952 in Flight Magazine. Only two Vosper 46 foot RAF Crash Tenders (or firefloat Mk. 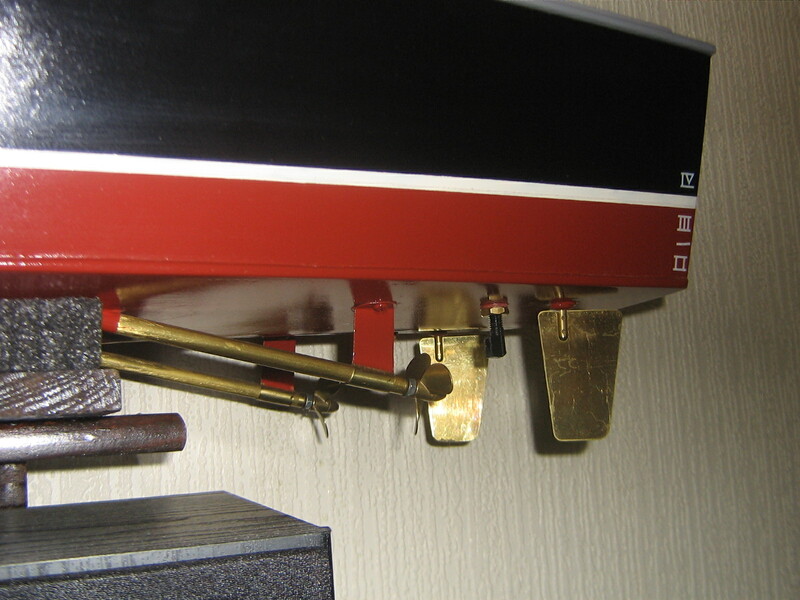 2) of this type were produced by Vospers. 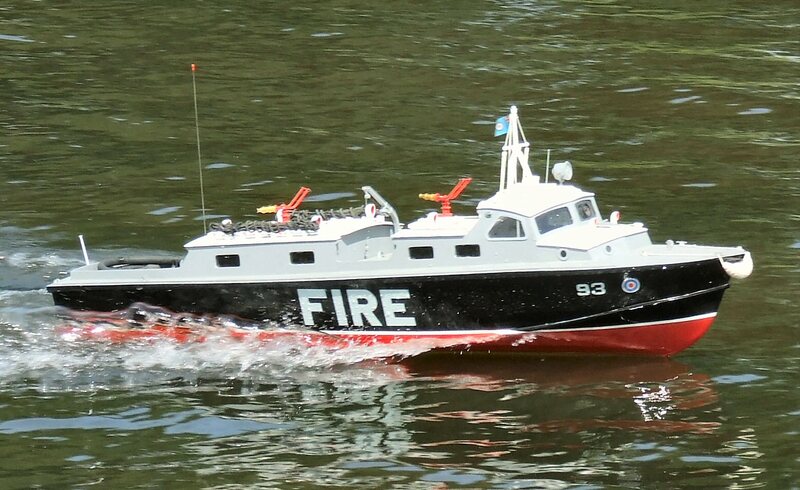 Firefloat No. 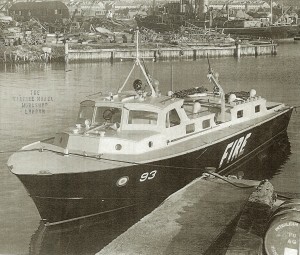 93 was delivered to the RAF Marine Craft Section based at Calshot on Southampton Water in approximately March 1952, it appears to have spent most of its life in storage probably because the Sunderland Flying Boats were being withdrawn from service during this period and its role therefore became redundant. No. 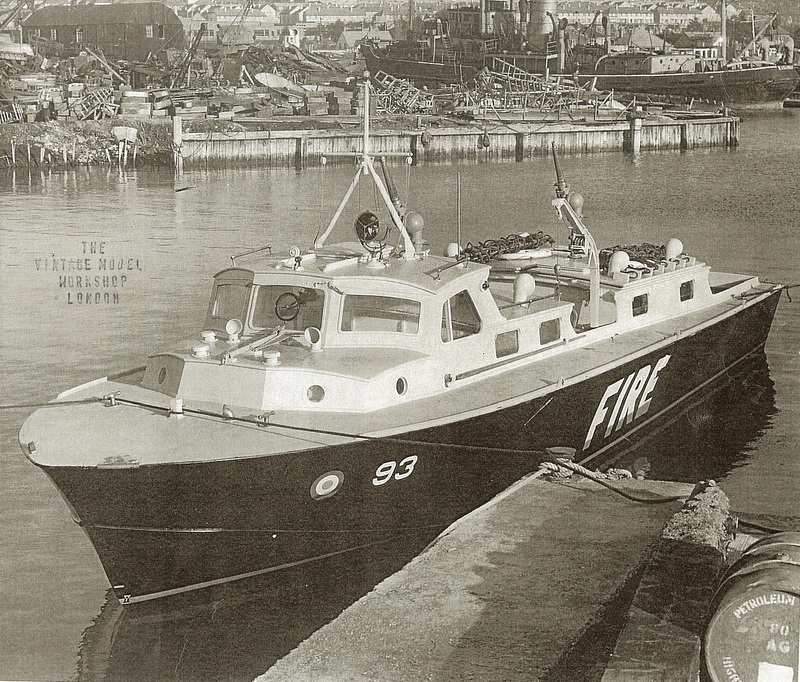 93 was struck off charge in July 1958 and disposed of. No. 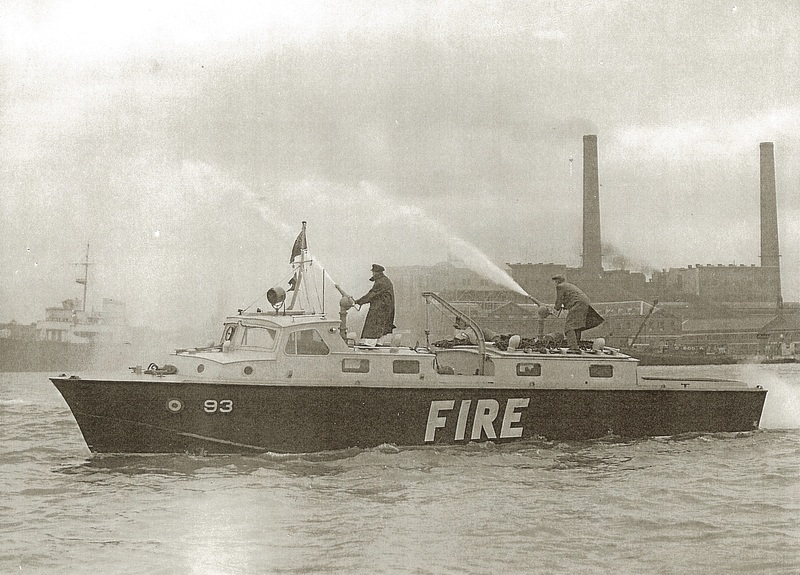 94 entered service in about 1952/1953 and was damaged and stored at number 238 Maintenance Unit until July 1958 when it too was struck off charge. 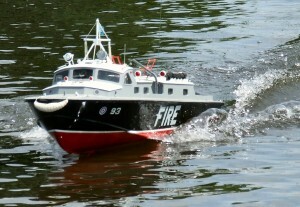 It is not known what happened to the two craft after this date. 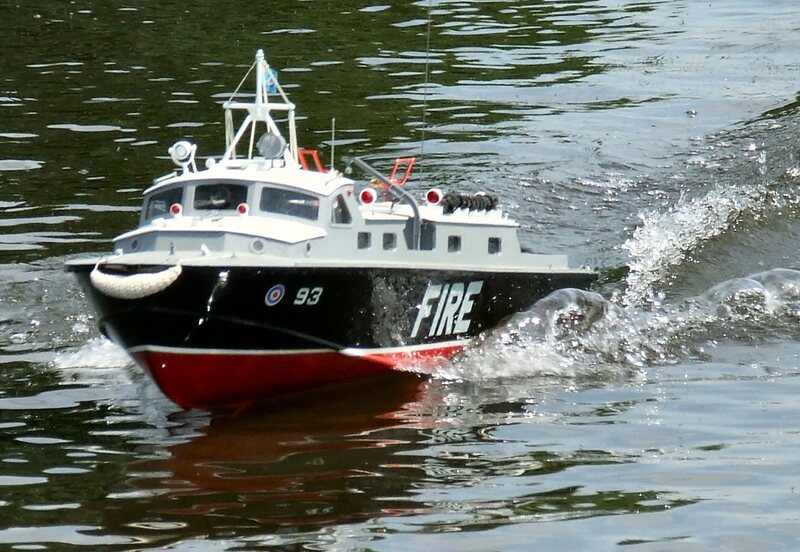 The main power units for the craft were provided by two Meteorite 8-cylinder petrol marine engines of 375 bhp at 2400 rpm, this gave a top speed of 28.4 knots. 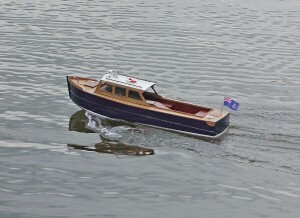 Fuel consumption at top speed was nearly 48 gallons per hour. 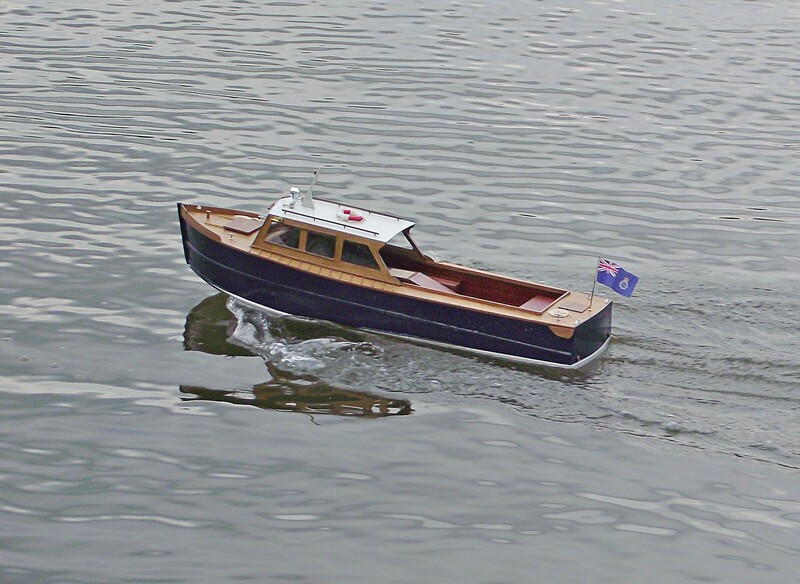 A separate smaller Ford V8 engine was used to operate the two foam/water monitors and a smaller JAP engine for the bilge pumps. A crew of five was intended in service, construction was wood, hard chine, plywood frames and double diagonal planking. 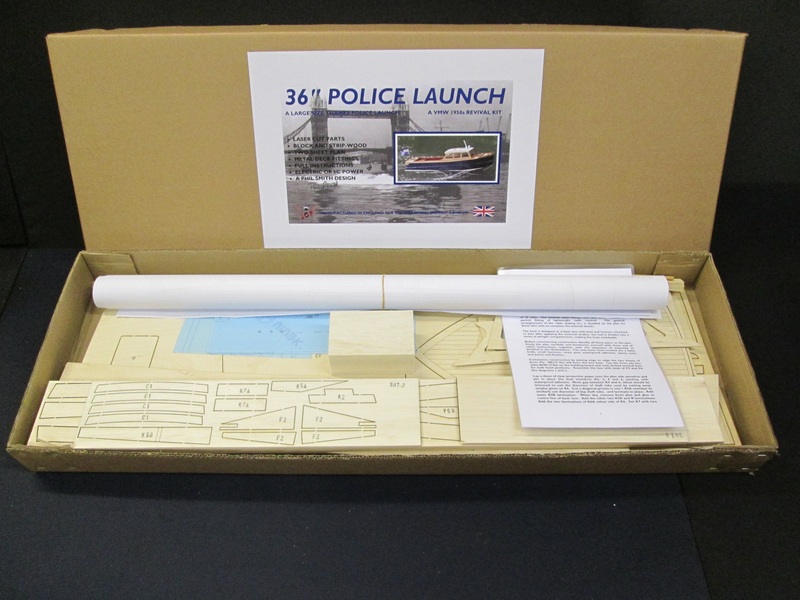 Introducing the 36″ large scale Thames Police Launch c.1950. 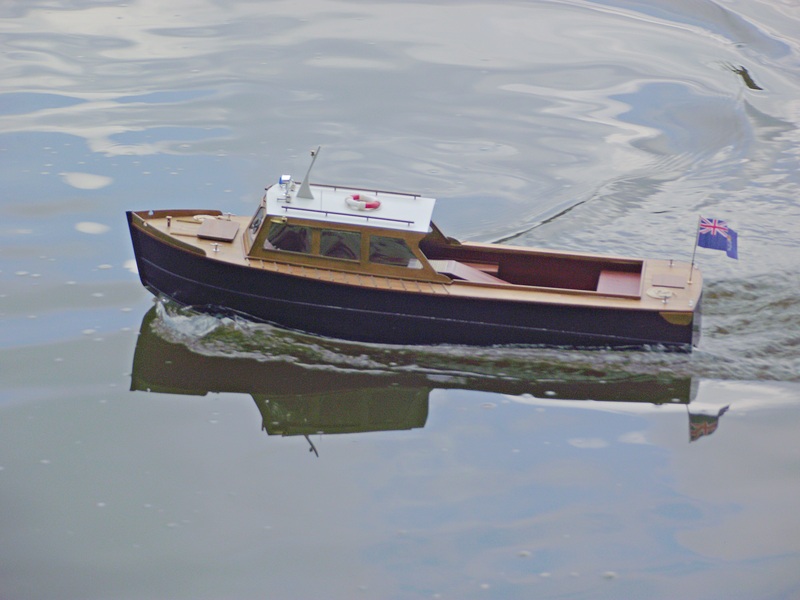 The original design for this model was based on the Metropolitan Police Thames Division River Police Launch constructed at Teddington by Toughs Boatyard in the late 1940s/1950s period. Ace designer Phil Smith introduced the popular smaller 26″ version for Veron in 1951/1952. 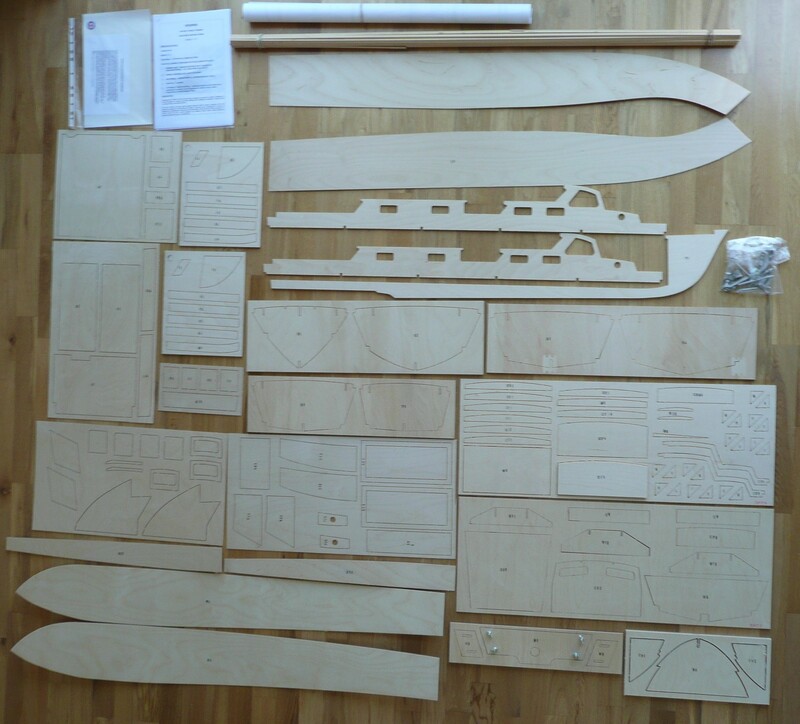 It utilised mixed balsa and ply construction ( a combination of both strength and lightness gained through Phil’s model aircraft design experience). This new 36″ (940mm) kit follows that tradition. 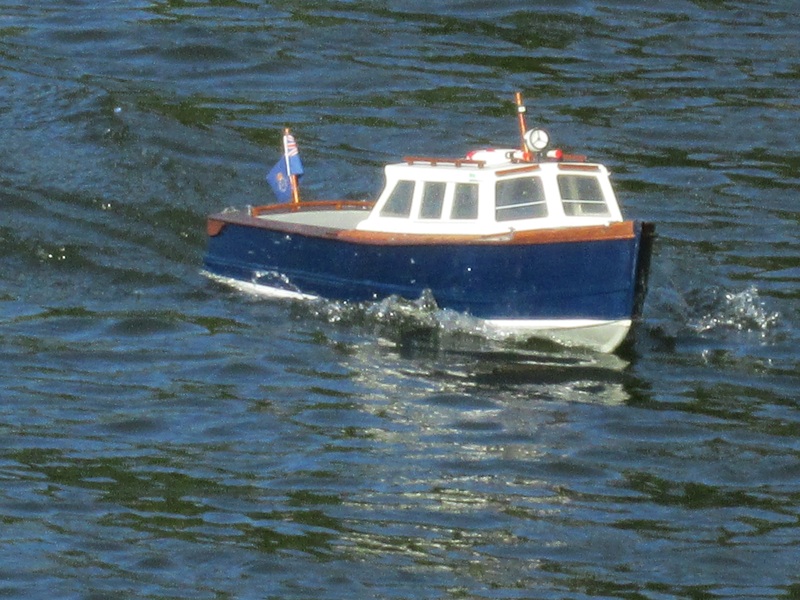 VMW with Colin Smith (Phil’s Son) has enlarged the original model to the increased length of 36″ (1:10 scale). 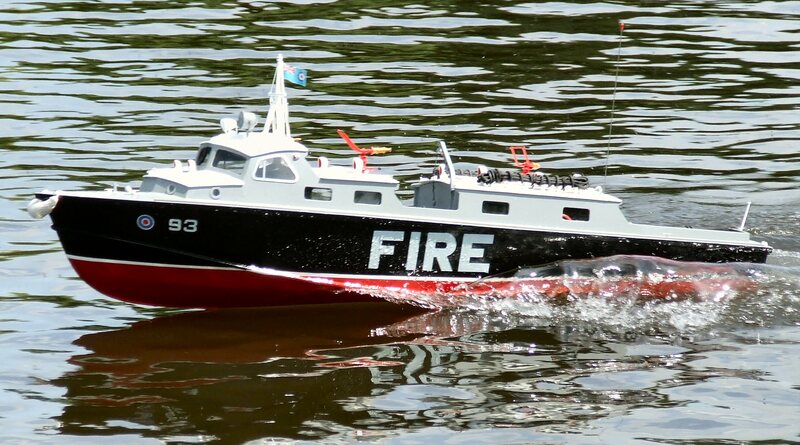 This larger version has been built and tested by independent modellers and has proven to be more realistic, particularly on the water and has a lively performance when fitted with the recommended brushless motor. The model’s lighter weight and length is a particular advantage for transport to the water by senior modellers. 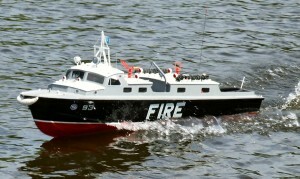 The construction of the 36″ version remains the same as the original Veron kit with some modifications. 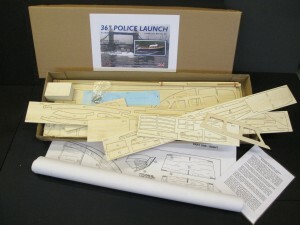 All of the balsa and ply sheet parts and deck and skins are computer laser cut for accuracy and etched deck lines for added realism, obechi stripwood, balsa block and cabin window material are included. There is a full-sized two-sheet detailed plan and instructions and white metal deck fittings. Basic box construction principal detail by Rob Briancourt St. Albans & District Model Engineering Society. 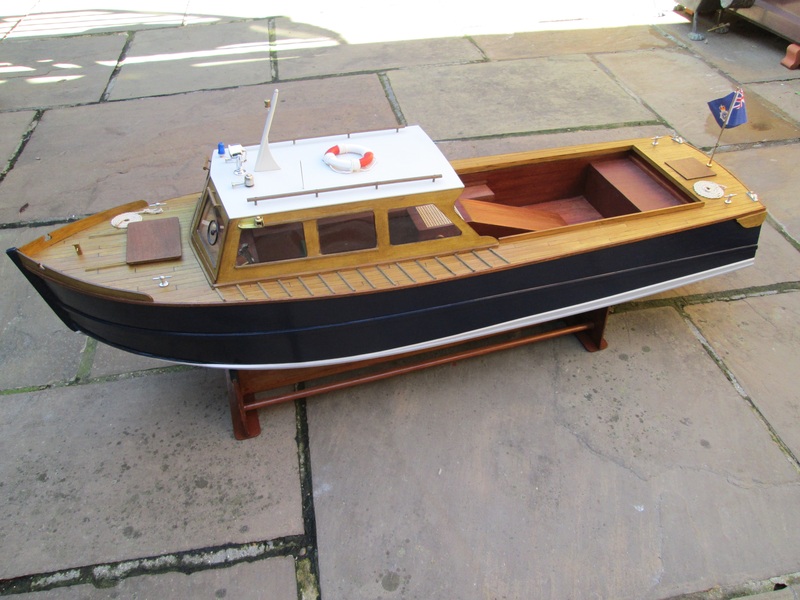 Near completion prior to paint finish with additional detailing by Rob Briancourt St. Albans & District Model Engineering Society.